The Rappahannock Independent Film Festival (Riff) begins next week (August 27-30) and I couldn't more excited. This is the second year for Fredericksburg's global motion picture event and it looks to be quite promising: Check this link for a sneak peek at some of the films. 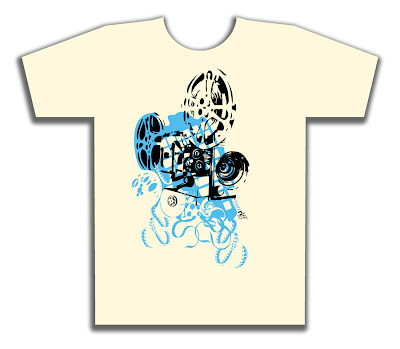 Men's and Women's tees are printed on American Apparel organic cotton shirts. Sizes (S,M,L,XL,XXL) $15 each. If you look close at the graphic, you'll see an amalgamation of different components that come together to produce this wonderful thing called cinema. The light blue background merges these elements with Fredericksburg's cityscape and essentially, the Rappahannock River.